Three quarters of the money out of the banks. Central and calls for investing. 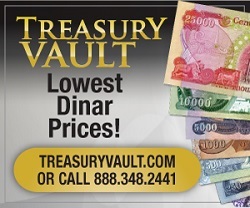 Bond Ladys Corner » NEWS FROM IRAQ » Iraq Dinar & CBI News » Three quarters of the money out of the banks. Central and calls for investing. It is estimated by experts in Economic Affairs, that three quarters of the HKMA "hoarder" is very large, so expert that try to attract money Bank compacta is the sensor in case of cash reserve has, especially since half the drop period not exceeding two years Means there are dramatically in a short period, necessitating real steps and called for the need to move away from deficits in the public budgets for the coming years because that means we're going to Central Bank funds, which was not true, in our internal and external borrowing, stressing at the same time daro That the Government was working to start mixed projects shared by the Government and private sector and attracting foreign investment sector probably belonging to an investment firm has these projects, so the parliamentary economic stresses that the cash reserve with the Central Bank and that it was not in danger but it's close.. The Central Bank Governor was public relations agency, to cash Central has not available, pointing to plans to attract money stashed away and pumped into the banking system at the same time, noting that compactness is a problem and a concern for many countries, especially after the recent technological developments and the subsequent Achievements and enormous savings in the entry for the production elements, stressing: that the Central Bank has planned to solve this issue by putting plans and studies to attract money warvadha within the banking system". Economist Amer jeweller in interview for "(how), that the Central Bank wants to attract money stashed away and talks this talk it might be sensing danger in the case of the cash reserve, which is all agreed even if spoken by anyone, but: when the reserve is reduced to half. A period of up to two years, it is considered that there are dramatically in a short period and this decrease if there must be real steps taken and do not expect continued decline and keep counting on oil, we should strive to not put next years budgets deficit because the deficit means we're going to a Loyalist Central Bank which is not true, especially since our internal and external borrowing. Jeweler finds: the Central Bank yet, though declining still reserves within the boundaries of international standards Secretary, but we still rely on bombshell comes from oil revenues and only talking about maximizing other resources including money stashed away, and is step won't work. One either 2018 year or subsequent years unless the Iraqi economy and society reassures trusts him, especially as the Government and private banks are performing away from actual investment to increase reliability and people resort to put their money in those banks, today estimated that three quarters of cash Rolling is a very big issue. But goes on when we measure the existing funds and the Central Bank keeps the sale see a relative improvement in revenue, the next budget must be based not on urgency, we need to set ourselves up to be our accounts consistent with actual revenues and therefore not be planned budget Negative, especially as we prepared a supplementary budget 2017 year because revenues improved, straight by saying: we are recalling these points we want to have a balance between revenue and what sells, not worry ourselves even Central Bank increase in withdrawals from the central reserve. Financial adviser said the Prime Minister, Mohamed Saleh appearance last Saturday, the Iraqi Government is engaged with the IMF on the subject of financial consolidation and reducing spending and maximizing resources and debt sustainability within economic limits and maximizing revenue Secretary ", indicating that the balance in 2018 at Pipeline semifinals, will be presented to the Cabinet next month, according to the times. Jeweler finds: the modern Central Bank that cash is not available, a problem and can get bye time, but presumably not scarcity access prediction for weeks or months but for years, because the fact that Central Bank reserves decreased and continues to decrease albeit quietly and they said earlier that If Central Bank reserves reached the minimum we must have other procedures, so we rely on forecasts and to maintain constant orientation to maximize the resources of the country. He continues: even money stashed away can draw her out to projects encouraged by the State, regardless of whether the Government's announcement contributed to mixed projects that citizens trust the Government more than anything else, continuing: today the Government if a mixed project shared by the Government and private sector it might participate. Foreign sector, then the citizen can attract to buy shares in those projects, and these measures begun by other States in accordance with the strategy of stretched for years even greater reliability between the citizen and the State, as the actual actions of the Government are increasing reliability in the citizen, but also prepare steps to improve Investment environment in the country, both for the citizen or foreign investor. Meanwhile the parliamentary Economic Committee Member says dulaimi olives in the interview for "(how), the Central Bank's cash reserve status and was not in danger but is close to it, there are directed to activate money stored in order to provide citizens in State banks, as there are banks. Already started trading bonds pose to attract money stashed away, or by capturing it in banks, especially since there are already lots of chunky whether citizens or venture capitalists. Dulaimi recalls: that everyone become aware that the financial situation in Iraq is not good but is akin to gravity, for many reasons, notably lower oil prices and war that consumed a lot of money with operational expenditure which takes a lot of the public Treasury, however: so I hope there are wizards In order to get out of this fact, we count on financial advisers and economists and economic commissions in the premiership to develop and implement solutions and treatments for out of any financial crisis, and is inviting us to not to be pessimistic and hope to have a good financial future for Iraq. The term means "compactness" holding cash and kept her on the circulation and it may be that compactness by burying money or save them in boxes inside the houses and not taken out of circulation in the money and capital markets. The Iraqi Central Bank 19-2-2017 announced foreign exchange reserves slid to 49 billion dollars as a result of the continuing decline in oil prices in global markets. Mentions that Iraq suffers from financial hardship since the year 2014, as a result of falling oil prices with growing war expenditures on ISIS, forcing Baghdad to borrowing from international financial institutions like the World Bank and the International Monetary Fund and withdrawals of fiscal reserves to the Central Bank.